On the afternoon of April 12, 2019 local time, Premier Li Keqiang met with Prime Minister Jüri Ratas of Estonia in Dubrovnik. 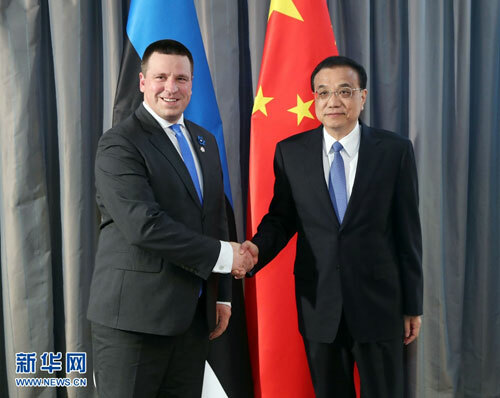 Li Keqiang noted that under the joint efforts of both sides, China-Estonia relations have shown a booming momentum with fruitful practical cooperation and broad cooperation prospects. The two countries have maintained close exchanges via multiple channels, and comprehensively promoted bilateral relations and cooperation by utilizing the platform of the 16+1 cooperation. China is willing to enhance cooperation with the Estonian side in the fields of e-commerce, education, innovation and digital economy, and expand imports of Estonian agricultural, livestock and marine products Chinese consumers love, so as to jointly promote the sound and stable development of bilateral relations. Jüri Ratas expressed that Estonia-China relations are close, and have enjoyed sound development with constant expansion and deepening. The two countries witness close people-to-people and cultural exchanges, with more and more Chinese tourists coming to Estonia. The Estonian side is ready to take the signing of a series of cooperation agreements as an opportunity to further promote practical cooperation with China in the fields of agriculture, artificial intelligence and 5G, and to promote bilateral communication and coordination in multilateral areas.